The criticisms continue to roll in, with critics saying that the websites do not work well, that people are visiting the website but not enrolling, and that there are too few enrollees. What expectations are reasonable? What can we learn from the introduction of the Medicare Part D drug benefit in the fall of 2005? In a previous blog, I pointed out that the Medicare Part D plan finder website did not even get up and running until 3 weeks beyond its scheduled date and that there were plenty of problems once it was launched. Furthermore, 1-800 phone lines were jammed. Critics in 2005 pointed to inaccuracies both on the website and in the answers coming from call center representatives once consumers got through to a person. But what about enrollment? Similar to the schedule the White House recently announced, the Bush Administration waited to release the first enrollment numbers until a month after open enrollment started. 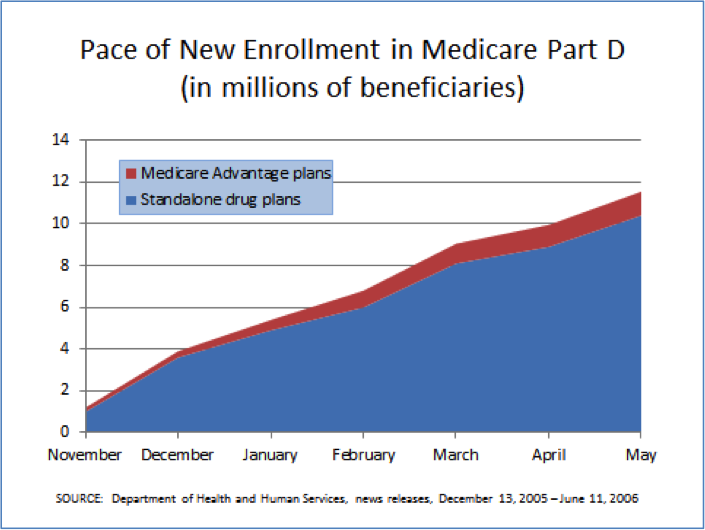 The first release from the Department of Health and Human Services (December 13, 2005) reported that about 1 million people enrolled in standalone drug plans during the first month and another 200,000 enrolled for the first time in Medicare Advantage plans with drug coverage. These were not the only participants in the new program, since the law required the transfer of Medicare-Medicaid dual eligibles from Medicaid drug coverage to Part D. Plus, those already enrolled in Medicare Advantage plans had a simple option to add drug coverage to their current plan. But the total of voluntary new enrollments in the first month was about 1.2 million people. On January 17, 2006, DHHS released numbers that included everyone who had enrolled in time for the start of coverage on January 1, 2006. Thanks to a surge of late-December signups, enrollment in standalone drug plans had grown to 3.6 million, together with 300,000 new Medicare Advantage enrollees. Many observers at the time had expected that most people would get signed up in time to get their coverage started at the first opportunity. But that was not the case. By law, the first year’s open enrollment period for Part D ran until May 15, 2006. DHHS reported numbers that included everyone who signed up by that date. As the graph shows, enrollment grew at a steady pace across the six months of the first open enrollment period. A key lesson from the Medicare Part D experience is that two-thirds of all voluntary Part D enrollees waited to sign up until after January 1. Shopping for insurance, whether in Part D or in the new insurance marketplaces, is a complicated learning process. Consumers need to make decisions about the right level of insurance for their needs and which plan works best for them. They want to understand their costs and how much will be subsidized. Shopping and making a decision will take time and may involve multiple visits to the website, calls to the telephone call center, or meetings with a counselor. Modest enrollment numbers in the first month, let alone the first week, mean little as an indicator of eventual success. We should read early enrollment numbers in the context of the full enrollment period that runs through March 31, 2014. How Does ACA’s First Week Compare to Medicare Part D’s? This entry was posted in Implementing the Affordable Care Act and tagged aca implementation, affordable care act, enrollment, health insurance marketplace, Medicare Part D by CHIR Faculty. Bookmark the permalink.